The main objective of this document is to guide your implementation with the PagadorButton, for Pagador platform. The customer finishes to checkout, and go to payment process. b) In order to use this resource, for security reasons, it will be mandatory for Braspag to require, at least a valid IP of the establishment. Otherwise the requisition will not be authorized (HTTP 401 NotAuthorized). For matters of safety, this ticket will give permissions to the establishment to save only 1 card in the deadline already established on the answer, through the attribute Expiresln (for default 20 minutes). What happens first will invalidate this same ticket for future usage. c) The script provided by Braspag present three events for the establishment’s manipulation and treatment which are: onSuccess (where will be returned the PaymentToken after the card data is processed), onError (in case there is any error in the consumption of Braspag services) and onInvalid (where the result of the validation of the inputs will be returned). On the input validation, the establishment may use the entire card data validation layer realized by Braspag in order to simplify the treatment on the checkout form. The returned messages on the validation result are available on the following languages: Portuguese (default) English and Spanish. The PaymentToken will be the token that will represent every card data provided by the buyer. It will be utilized by the establishment so there will not be the necessity of treating and processing the card data on your side. 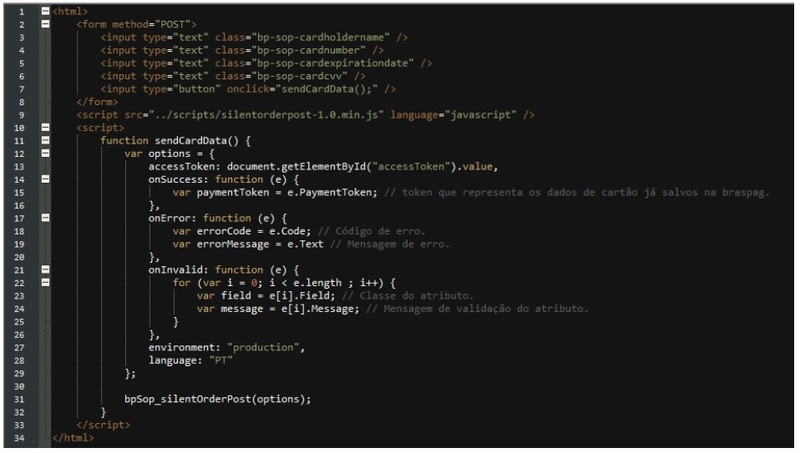 This token may be used both in transactions using Hosted Page or SOAP / REST implementations of Pagador. For matters of safety this PaymentToken may be used for only 1 authorization on Braspag. After the token processing, it will be invalid. If you didn't find your answer, send us a message.